Like the previous limited-time offer for Mockingbird, Emma costs 200 Command Points to recruit. 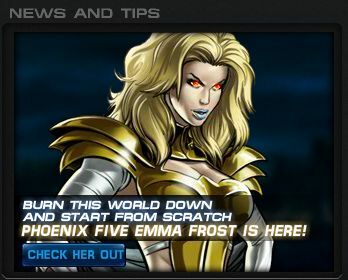 Unlike Mockingbird, Emma Frost is available for 6 days rather than 4 (which means you have until about 1/2/2013 to recruit her). Her alternate Phoenix Five costume from Spec Ops 3 is also available for Command Points. It'll cost you 66 Command Points for the Infiltrator suit and 50 Command Points for the Tactician suit. With the way things are going look for future Spec Ops "exclusive" characters to be re-releases in the future at the same price point (200 CP).